Young Artists Garden, Fiesta Arts Fair 2015. Photo by Page Graham. This is a family-friendly event, including a Young Artists Garden with activities for the wee people. Faculty and students will also be on hand to give artist demonstrations. There are tasty eats and beverages for sale and the big folk can definitely get their margarita on. Representing in the gustatory delights department this year will be La Gloria, La Fruteria, Kona Grill, Big Licks, Corn Wheel, Chocollazo and Social Ice. La Gloria goodness. Fiesta Arts Fair 2015. Photo by Page Graham. Be prepared, coupons are required for all food, beverages and children’s activities. Admission and coupon booths accept cash only. Most artists take credit cards, but have no fear, there will be mobile ATM units onsite. Los #3 Dinners perform at Fiesta Arts Fair 2015. Photo by Page Graham. Completing the beautiful setting and great art, there is also a fine musical line up all weekend. Just head on down to the SSA campus at 300 Augusta Street (at the corner of Augusta and Navarro). Parking is usually pretty tight, so be prepared to take a stroll to your destination. We usually take our bikes or the scooter. Always be prepared for the weather. Usually, we can rely on hot and sunny, but it looks like there is a call for rainy days this weekend. Look on the bright side, what’s a little rain? You won’t melt, and you won’t be sweltering in the heat. Let’s just hope Mother Nature has gotten hail out of her system for awhile. The artists will be there rain or shine, so we should be, too. There is much more in-depth information online, including parking and transportation options. $16 weekend pass; $10 daily for adults; $5 daily for children ages 5-12, and free for children under 5 accompanied by adults. Ticket sales benefit the general fund and activities of the Southwest School of Art. 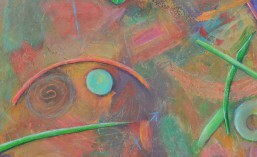 This entry was posted in Art Events, Fiesta, Music and tagged Art, Fiesta San Antonio, San Antonio, Southwest School of Art. Bookmark the permalink.